Burly is made of ancient California redwood, salvaged from the forest floor where it had rested for decades. While lumbermen hauled away the straight trunks, burls and branches were left behind to rot. Only they didn't; resistance to decay is the particular attribute of the redwood tree's timber. It is also very lightweight; the entire guitar weights in at just over 4lbs (1.85kg). This is aided in part by the revolutionary Lace Alumitone pickups, as well as the low-profile Hipshot headless system. 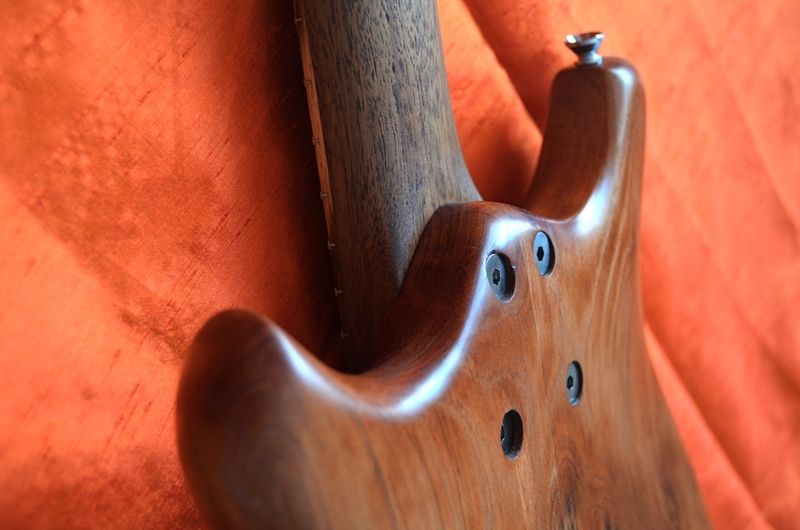 The neck is of my signature black walnut, topped with a fretboard of striped zebrawood. Like all Sankey Guitars, it comes equipped with stainless steel frets, a dual-action truss rod, and great tone!